It all started with a call from San Diego, California. The caller was Bill Zilinek, the son of a Redding family that Dan Cruson, Newtown Town Historian, past president and current vice president of NHS, had known while teaching there. Bill was looking for a home for some artifacts that belonged to the Adams family that he had inherited, and he asked Dan if he would accept them for the Historical Society to which Dan readily agreed. There were, in all, 52 pieces that had belonged to President John Adams, his son, President John Quincy Adams, and a great, great grandson, John Quincy Adams Johnson. 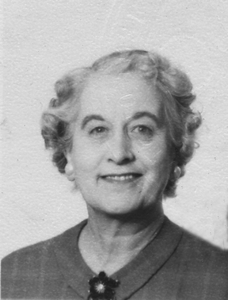 The items had been passed down through those generations to the daughter of John Quincy Adams Johnson, Abigail J. Kelly who lived in Redding Ridge and was the last in that line of the Adams family. 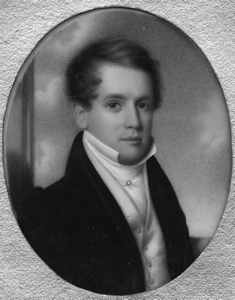 Abigail had no heirs so when she died the collection passed to Charles Zilinek who was her neighbor and good friend. After Bill's father's death they were passed on to him and he was looking for a permanent home for them, one preferably where they would remain together as a collection and be made available to the public. Dan agreed to become the curator of the collection and accepted it in the name of Bill's parents, Charles and Helen Zilinek. 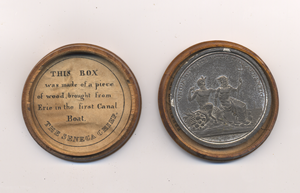 Erie Canal Medal John Quincy Adams inaugural roughly coincided with the opening of the Erie Canal on October 26,1825, so the collection contains a commemorative medal presented to him by the city of New York in 1826. This metal appears to have been struck in white metal. 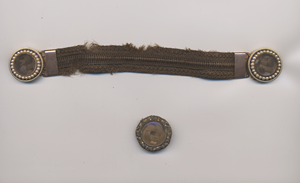 According to one report, there were 150 medals struck in this alloy and these were presented to various dignitaries in a small round wooden box, like the one here. According to several numismatic articles on the metal, it is extremely rare that the box survived. JQA Inaugural medal The gem of the John Quincy Adams material is his inaugural medal. There were a few silver medals struck, but they were made of White Metal. White Metal refers to a number of dull silver colored alloys which contain some combination of lead, zinc, tin, or copper. White metal was often used to make trial strikes of a medal later destined to be struck in silver or gold. 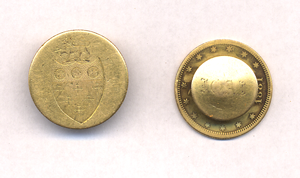 In John Quincy Adams' case, however, the bulk of his medals were struck in the inferior allow. Because the run was so small, the Adam's inaugural medal is extremely rare and unusually desirable. 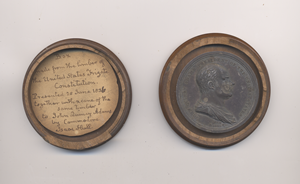 This medal is housed in a round wooden box that contained a paper label with an inscribed date of 25 June 1836 when it was presented to John Quincy Adams by Commodore Isaac Hull. Since the inaugural medal that was contained in the box was issued was issued on March 4, 1825, the box was obviously not originally intended to house it, but was later adopted for its protection. Signet Seals Two of these three signet seals belonged to John Adams. 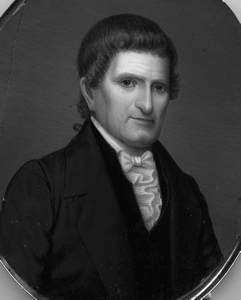 The third is reputed to belong to Mrs. John Quincy Adams. Two of the are made of gold with a carnelian insert. Carnelian is a semiprecious gem stone and is among the hardest stone to carve. Regardless, the maker of these seals who was probably Italian, carved an intricate miniature design with great detail. The pewter seal was definitely used by John Adams. Its impression is found on wax that was used to seal some of his notes on Herodotus. Ring with hair This finger ring appears to have belonged to Abigail Adams. It also contains hair woven in a checkerboard fashion similar to the broach. 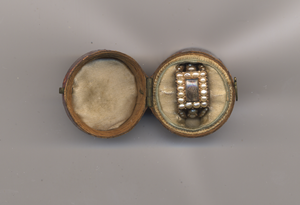 The use of gold and seed pearls appears to be very similar to the bracelet ends and may have been made by the same jeweler. 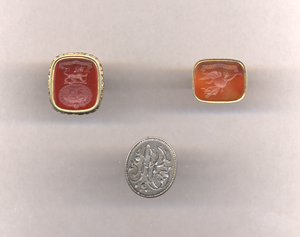 JQAJ cuff links These cufflinks belonged to John Quincy Adams Johnson and were made from ten dollar gold pieces (known as eagles) and two, two and a half dollar gold pieces (known as quarter eagles). The reverse of the eagle was burnished and inscribed with the Boylston arms, which had been adapted by the Adams family. The reverse of the quarter eagles was likewise burnished and inscribed with Hohnson's initials. The date on the eagles is 1881 giving us a rough idea of when they were made. John Quincy Adams and wife Whereas portraits of the two presidents are relatively common, likenesses of John Quincy Adams Johnson are fairly scarce. Ironically, shortly after this donation was received, a Google search of Johnson turned up a news photograph of him on E-bay which we promptly purchased. It was taken on February 10, 1933 and showed Johnson with his new wife, Caroline Sutherland, who he had just married in "the Little Church Around the Corner." 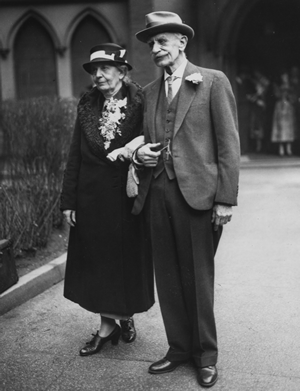 His first wife, Caroline Curtis, had died in 1932 so this was his second marriage, but her first. According to the photo's caption this was the climax of a fifty year romance which had begun when they first met in Newburyport, MA. They enjoyed over five years of marriage before he died in 1938. These three fraternity pins belonged to John Quincy Adams Johnson. At Yale in the 1870s, fraternities were divided by year, thus Alpha Sigma Phi was a sophomore fraternity and Johnson was a member of it in the 1875-76 school year. Late in that school year there was a political reorganization of the sophomore societies. The junior fraternity sponsored Delta Beta Xi which inherited most of the members that had belonged to Alpha Sigma Phi including Johnson. Therefore Johnson was one of the last members of Alpha Sigma Pi. He then passed into a junior fraternity Delta Kappa Epsilon, and the senior fraternity Psi Upsilon before graduating in 1978.